Biography of Irish Landscape Artist, Figure Painter, Muralist. The Irish landscape artist, portraitist and mural painter George Russell, known by his pseudonym AE, was born in County Armagh in 1867. As well as a painter, Russell was a poet, playwright, journalist, editor, critic, mystic and evangelist for the co-operative movement. Brought up in Dublin, he studied drawing and painting at evening classes in the Metropolitan School of Art. After this he attended evening classes at the Royal Hibernian Academy. A fellow student was WB Yeats. In 1888-9, Russell won the RHA prize for the best figure painting from the living model. In 1890, AE Russell began work as an accounts clerk. In his spare time (encouraged by WB Yeats) he wrote poetry, studied theosophy and painted murals. In 1897, Russell joined the Irish Agricultural Organization Society (IAOS), an agricultural co-operative movement begun by Horace Plunkett. Plunkett needed someone to help develop credit societies. W.B. Yeats suggested Russell, who duly became Assistant Secretary of the IAOS, travelling extensively throughout Ireland as a spokesman for the society. In 1898, Russell married and settled in County Dublin where he continued to write, paint, create murals, illustrate, design costumes and tapestries. 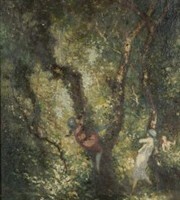 In 1903 he exhibited over 40 oil paintings, mostly landscapes, at Leinster Hall, Dublin. More exhibitions followed, both solo and with Countess Markievicz. His output of pictures rose, including portraits, not least because they were a valuable source of extra income. In 1905, he showed at the Royal Hibernian Academy, the Fine Arts Society in London and at the London Salon. From 1907-1911, he took part in four group exhibitions at Leinster Hall with (inter alia) William Leech and Dermod O'Brien. He also created several murals and friezes. AE Russell continued painting and exhibiting throughout the period up until 1928. In that year he undertook the first of several lecture tours to the USA, limiting himself during this time mainly to sketches, illustrations, charcoal and crayon drawings. He died two years after his wife, in a Bournemouth nursing home in 1935. The following year a memorial exhibition was held for him at the Daniel Egan Gallery, Dublin. In 1967, a centenary exhibition of Russell's works was staged at the Hugh Lane Municipal Gallery of Modern Art, as well as one at the National Gallery of Ireland. AE Russell's paintings are held in a number of public collections throughout Ireland. The auction record for a work by George Russell was set in 2007, when his landscape painting, entitled Young Girls Sitting Upon Rocks with a Harbour and Headlands in the Distance, was sold at Whytes, Dublin, for €60,000.  For details of other painters and sculptors from Armagh, see: Irish Artists: Paintings and Biographies.  For more about landscape and mural painters like AE Russell, see: Irish Art Guide.  For more about fresco murals, see: Homepage.